Most web developers know that if their users enter a username and password to login to a site that isn't secured by an SSL certificate, an attacker can see their username and password in plain text. But making a secure login form isn't always as simple as it sounds and many large web sites have done it incorrectly. Though it is often misunderstood, there are good ways and bad ways to secure your website's login form with SSL. What are the risks? If an attacker can easily view someone's username and password, he can impersonate that user, and do massive damage by buying products, transferring money, reading email, etc. But there is a far more dangerous possibility: Because (ahem, unintelligent) users often use the same password on many sites (using the same password for their bank account as their Facebook account), an attacker can potentially compromise many other accounts. If you let people store a password with you, you must take responsibility for protecting it, even if the security of your own site isn't critical (e.g. a forum). 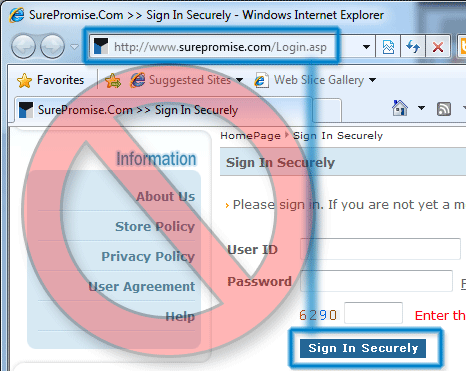 Not securing a login form at all is the most common mistake on the web. Unless you don't care if someone knows your visitor's usernames and passwords, or unless you use one of the alternative methods of authentication listed below, you need to use SSL on your login pages. There is no way for a user to know that the login information is going to be encrypted (Without studying the source code for the site). Internet users have been trained to check for the "golden lock" icon (or more recently the "green bar") to ensure a web session is encrypted before submitting sensitive information to a site. This is important to protect against phishing attacks. Removing that visual cue (even though the submitted information is encrypted), makes it look like the form is insecure. Those forms do actually encrypt the login information, but there is essentially no way for the user to know that. Do you think that is would be difficult to execute a man-in-the-middle attack on an http page with a login form? Well it isn't. There are even free automated tools, like SSLStrip, to do it. The only difficult part is becoming a man-in-the-middle on most networks. Now that we know how not to secure a login form with SSL, let's look at how we should do it. 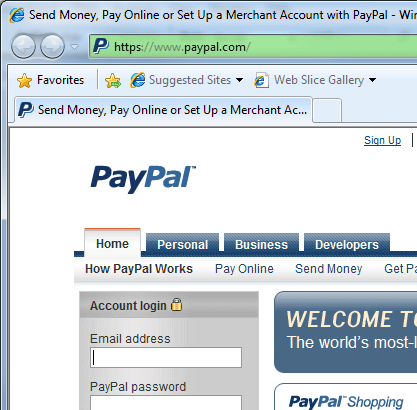 For convenience, many large sites and banks used to put their login form directly on their unsecured homepage. Fortunately, many (including http://www.bankofamerica.com/ and http://www.chase.com/) have changed to a more secure method that we can learn from. Even if we go to their homepage with http, it forwards to an https page. In combination with an EV SSL certificate that displays the unmistakable "green bar", the chance of a man-in-the-middle/phishing attack is virtual non-existent. Always enforce https on the homepage and include the login form there. This makes it more convenient to log in and more secure because users are more likely to bookmark the https homepage than a separate login page. Facebook Connect. Virtually everyone has a Facebook account and Facebook has made it easy for you to authenticate users using their Facebook username and password. The authentication happens on Facebook's own site (properly secured with SSL) so it is completely secure and means that users don't have to remember another username and password just for your site. OpenID. Similar to Facebook connect, OpenID allows users to authenticate on another site and there are many OpenID services available now, though it isn't as popular as Facebook. Twitter. Twitter also offers an API that allows your users to log in securely on their site using their Twitter account. Securing your login form correctly with SSL is really only one small part of securing your site, but without it, you are giving your users a negative impression of security. By doing it properly, you are helping all web sites be more secure by reinforcing user expectations.